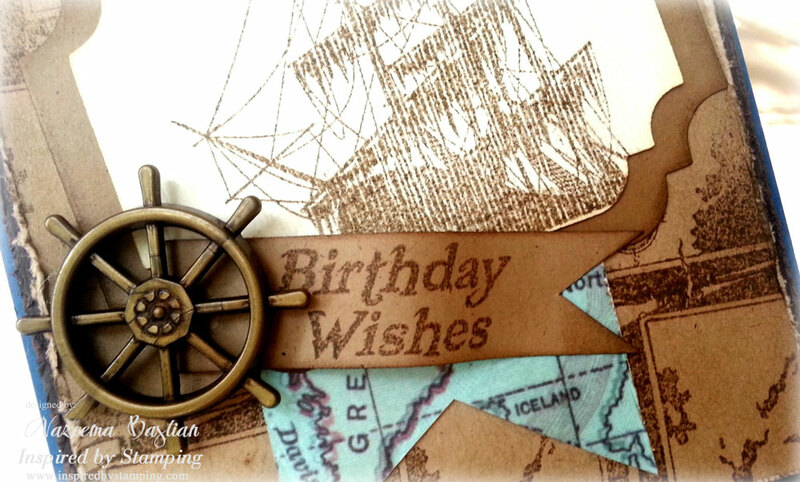 Welcome to Day 1 of Inspired By Stamping March Release Party!!! Today, I have the privilege of showcasing "Pirates" for you. This stamp set would be perfect for any little boy or man. Take a look at my card. I used 3 of the stamps from the Pirates stamp set on my card today. I stamped the map image on kraft card stock and used it as background. I used Fancy Labels Die 1 to cut the Vanilla card stock and the kraft card stock, which are edged with distress ink. Then I then stamped the ship on the textured vanilla card stock. Do you see the patterned paper? That was located and used just for Joanna, the creator and owner of Inspired By Stamping. 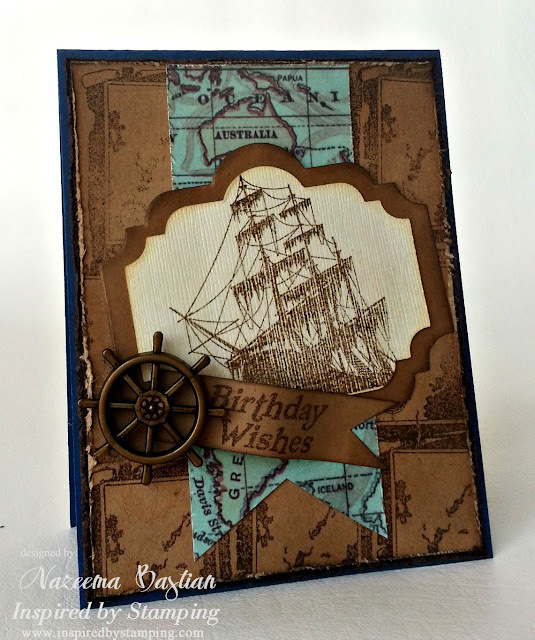 Here is a close up of one of the sentiment from the Pirates stamp set and the resin wheel. I think it's a perfect set for everyone. March 10 will be our release day party. The March release will be available for purchase. Inspired By Stamping will be offering free shipping for 24 hours after the release AND if you purchase the March Bundle, you will receive an automatic 10% discount at checkout. Please keep in mind that even though Inspired By Stamping is in Australia, any purchase over $25 has free shipping, so there is no need to worry about shipping rates! It honestly doesn't get much better than that. So how about a chance to win $25 to Inspired By Stamping Store. Leave a comment today and everyday til the 10th and a winner will be randomly selected. So if you like what you are seeing, wait til you see the rest of the sample cards the design team created for you. They are all so amazing and inspirational but, don't take it from me hop along along and take a peek for yourself. You are in for a treat. Excellent card Nazeema! Really, so impressive!!! Great card, love the added ship wheel! Whoa-ho Matey! What boy wouldn't love to receive this? From Peter Pan and Captain Hook to Jack Sparrow and his crew to Goonies! I feel a movie night coming on! Awesome card! Love the papers, image, and wheel. Love this very cool masculine card and how you laid it all out. Great work! Such a perfect masculine card! I love it! What amazing work! This is an absolutely beautiful card!!! love the rugged look of this card. You matched the elements so perfectly with the stamp.